But it’s not limited to local groups. This group, called Wall Therapy, seeks to bring inspiration to cities using mural art. Founded by Dr. Ian Wilson, the group of street artists, known as "therapists," rehabilitate the community’s image with locals and outsiders by beautifying it with art. Governale, who also runs the blog RochesterSubway.com, said that the space points to a growing focus on the rehabilitation of life in urban areas like Rochester. 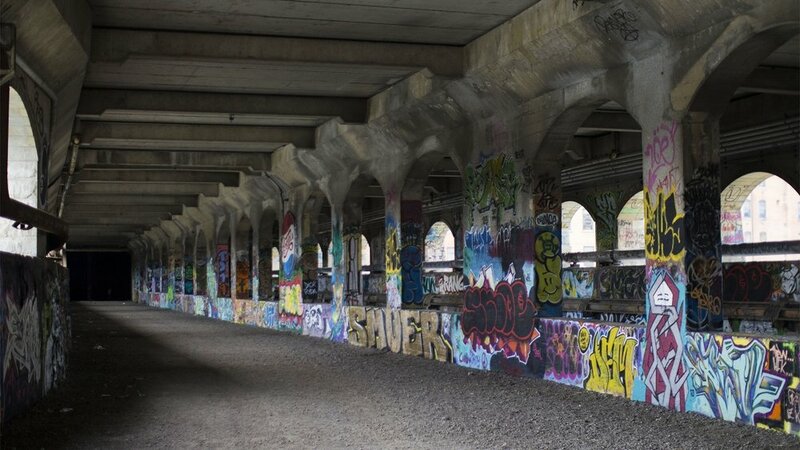 The connection between these tunnels and the city of Rochester is not new; more than serving as a canvas for international street art, the abandoned rail lines trace the history of the city itself. Sometimes called "The Image Center of the World" or "The Image City" for its historic connections to Kodak, Rochester was also once home to a portion of the Erie Canal. But in the early 1900s, after widening the canal several times, the state of New York decided to route the canal around the city. This left the city’s aqueduct, which crossed the Genesee River, empty. “It's … been the lifeblood of Rochester since the early 1800s." After considering what to do with the abandoned canal bed the city decided to utilize it for something else: a subway bed. “You already had the right-of-way, all you had to do was lay track and a road on top of it. So that’s what they did,” Governale said. The Rochester Industrial & Rapid Transit Railway opened in 1928 and ran until 1956, peaking during the WWII era as citizens tried to conserve resources by riding public transit. By the 1950s, Governale said, ridership was down and the automobile was taking over. Despite a late investment effort by the Rochester Transit Corporation the city decided to turn the subway into highway, parts of which are now Interstates 490 and 590. But not all of it. Roughly two miles of the subway still exists underneath the Broad Street bridge, stripped of its rails, and this is where the city’s “underground” street art scene thrives. Asked how the City of Rochester feels about people going down into the tunnels, Governale paused. Moving forward, there are a number of ideas on the table for what to do with this space. Some, like Governale, would like to see it stay a graffiti gallery. Others have proposed an underground park, or a mall of sorts with restaurants, shopping and entertainment. The City of Rochester also has a plan in the works called the Broadstreet Rewatering project, which would turn part of the aqueduct back into a canal, following in the footsteps of cities like San Antonio, Texas, which have made water a central downtown feature. What that is remains to be seen. But for the time being, the subway and its artwork remain a source of inspiration for locals and non-locals alike.